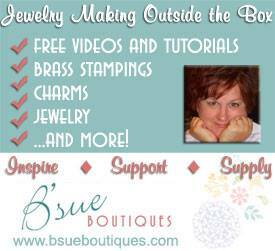 The online class I am participating in the Build a Line Challenge with B’Sue Boutiques (http://www.bsueboutiques.com/) is continuing and this is the second blog! It is a wonderful Master Class being lead by the remarkable Brenda Sue Lansdowne. The class is being taught so the participants will understand how to build a cohesive line of jewelry! Since I look at making jewelry akin to making art, I have found the class to be challenging for me as I am questioning my own beliefs regarding how I go about making art. However, for anyone to learn from a class, one needs to be open to learning new information! I have learned to be much more open! The funny part for me in this challenge as prior to my retirement, I was a trainer in my job. It was oftentimes difficult for the new hires to learn new things and as it has been difficult for me to learn new ways of thinking about how I create! I inserted an image above of a pyramid as part of what my jewelry focus is, along with one of the core concepts of the class to build a line of jewelry by laying a foundation of your jewelry line in tiers, lowest in price to the highest! 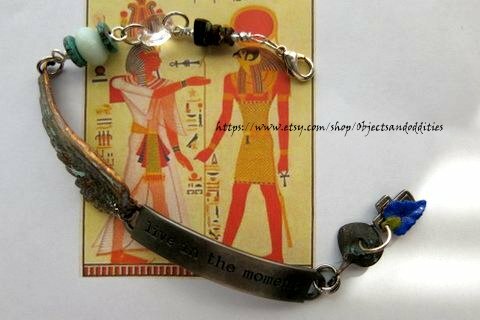 If you did not read my first blog on this subject, for my jewelry line, I chose a childhood love of ancient Egypt, and my desire to be an archeologist. 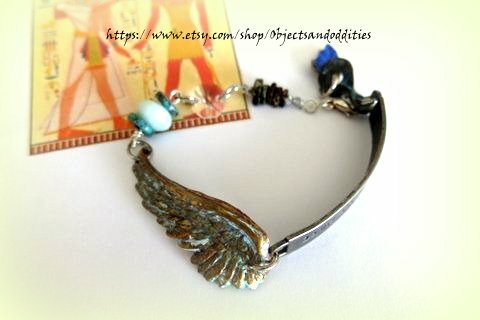 I also knew I would be able to acquire the jewelry components from Brenda’s website http://www.bsueboutiques.com/ needed for this challenge~ Throughout time humans have created adornment or jewelry. Brenda’s shop carries a plethora of jewelry components that have been made over and over since the 1900s. The 1920s had a time called the Art Deco Revival era that included Egyptian Jewelry. 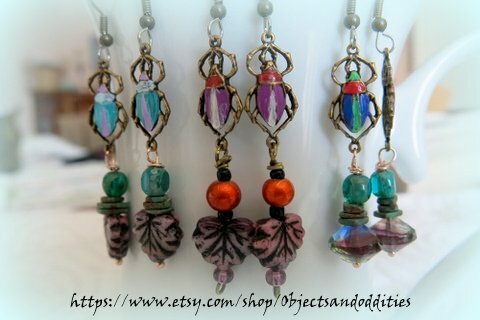 Since I wanted to start with the lowest tier of the pyramid for making my jewelry, I chose to experiment with Earrings that would go with all the other pieces of my “line,” of jewelry. I painted a lot of raw brass and some Brass OX to fit with Pantone’s Spring colors, and I have chosen a few colors to use from ancient Egyptian Times. To Mid-range of the Pyramid playing with some bracelet shapes with colors, beads, or possible sayings! 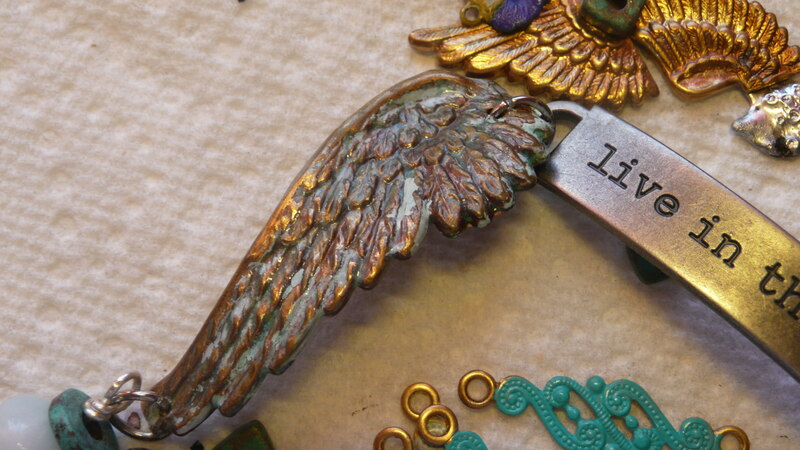 I still have some items on my work table that will be shown during the final blog next month! Finally during the last blog I will reveal the full collection An Egyptian Story in March. We are expected to have at least 5 separate pieces to fulfill the challenge. Here is a sneak peek at my top level design! Oh Nike I am loving those earrings! Great job my friend. Really looking forward to seeing your finished line now. I am still loving this theme of yours and the sneak peak at your top tier line has me wanting “more” right now! 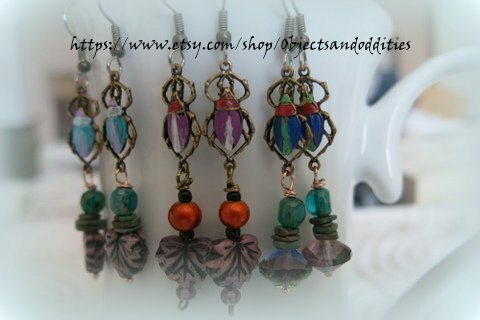 The earrings are great and traditionally Egyptian in color theme Well done! thank so much Marica! you are a sweetheart and I have some cuffs I am planning on using! So much to choose from as I did the same as you — purchased a lot beforehand! I hope to use it!!! Look forward to your entire collection also! STREGAJEWELLRY (LEE!!) thanks so much! I am so happy you want to see more! I am working hard on choosing the right things for my collection. I am off to read you now, cannot wait to see what you have made! Great blog post Nike. Beautiful and unique line. Can’t wait to see the full line. Thanks so much Irene! Will be over to read you in a second! Thank you for the history of Egyptian jewelry I had no idea. And good minds think alike, I painted my little Beatles with in patina and I used the little hearts with the pearls of the flowers part of my line. And you used the little Beatles in a totally different way which gives us both unique earrings. 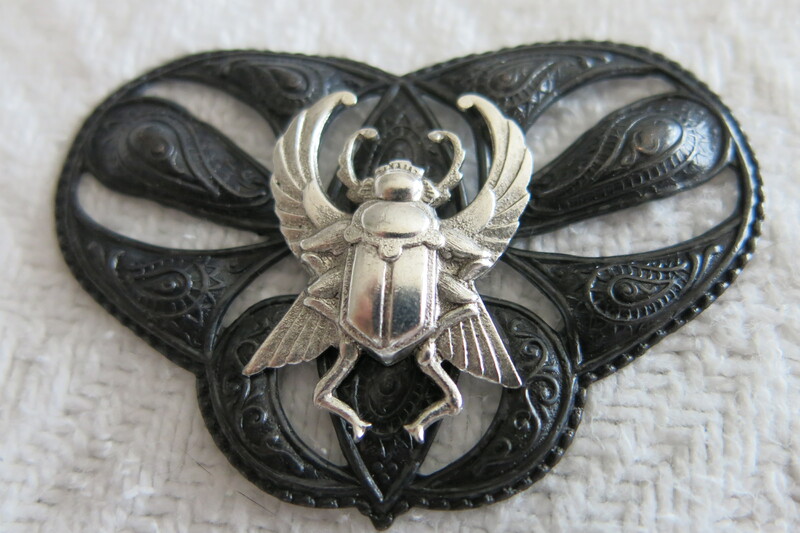 But the piece I really like is the one you haven’t finished I love that black matte with the silver beetle. Or maybe I should call it a scarab. I can’t wait to see what you do with that one. Cindy, I am so honored by your comment! I am also intrigued that we are working with similar components and coming at it differently! I cannot wait to see yours either! These are exciting times! And yes, Ancient Egyptians called our little beetles scarabs! xoxo to you dear heart! The Egyptian theme is sooo cool. I love it. The earrings are very pretty. Thanks Lori! I loved your blog!!! Thanks so very much Dana! I am having fun painting Beetles~ It is a lot of fun! I really love this line! Can’t wait to see more! Love!! Great concept. Can’t wait to see the big reveal of the entire line!! Ooh, the scarab earrings are lovely. I could definitely see them drawing people in to your line. They’re accessible and wearable. And all the colors make it hard to choose just one pair. And the bracelets are looking great. Can’t wait to see the big finale piece. well I’ll never argue against Egyptian themes and motifs! I think your earrings are very approachable for folks who aren’t strictly into Egyptian art. I love your Egyptian theme and your color pallet is gorgeous too. I can’t wait to see what other beauties you’ll create in your line. XOXO! I love the earrings. For obvious reasons! LOL 1 they are beautiful!!! @ I love the colors 3 you don’t have to like Egyptian jewelry to like your earrings. i love your bracelet and your top of the line focal!!! Great job!!! Have a Blessed Day! Im intrigued by your theme! Cant wait to see the finished line!! I commented in the wrong place, sorry! Your gorgeous work has always provided inspiration for me. I’m so looking forward to your finished line. The Egyptian theme is really interest and I love the way you are adding color. Can’t wait to see the finished line. Big fan of all things ancient Egyptian here. I love what you are doing with this theme. Looks good so far. Really like the earrings and cuffs, Nike. Nike – I adore YOU and your Creations and Creativity! You are a true soul creator – I feel so akin to you and we have never met! I will need to purchase a pair of your beetle earrings!!!! Thanks so much Alexandra! I so look forward to reading you and seeing your work. Thanks so much for coming and commenting! Love those bracelets, Nike! I’m anxious to see the rest of your Egyptian story! thanks so much and best wishes! Carole thanks so much! I appreciate you commenting and being there in the class! Maria, thanks so very much! I love it – your line is going to be beautiful! Thanks so much Amy! Your line is beautiful! Best wishes and thanks again! Kristy, thanks so much! You are a dear heart! Love your inspiration and the history, and your line! 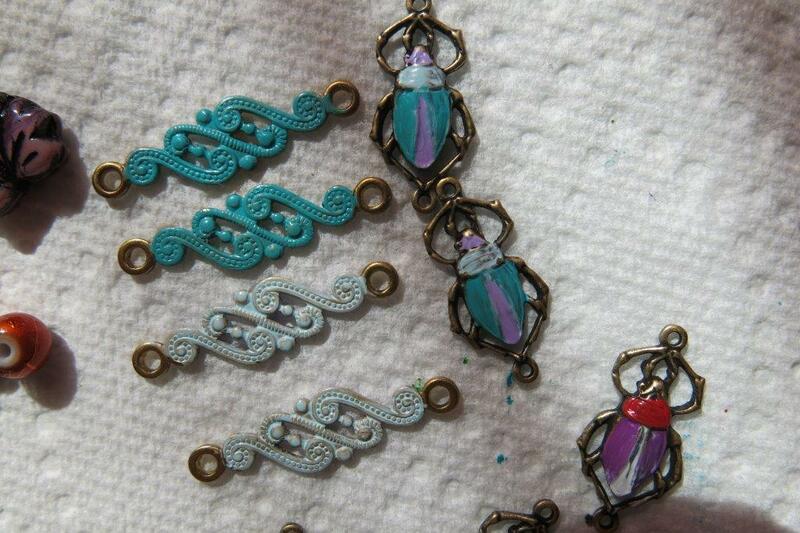 The earrings are gorgeous, and I am eagerly awaiting the reveal of your top level beetle! Thanks so much Gina! I am having fun watching all of us creating~ thanks for coming! Pamela thanks so much! Thanks for the praise and your comment too! Love the look and theme of your line. Your earrings were really cutr and I liked the way you laid out your i fo about your line. I look forward to seeing the end results. 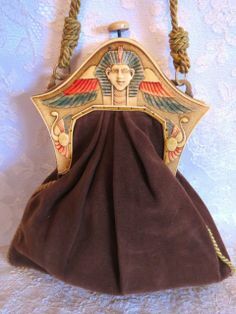 Your Egyptian revival jewelry is great! I love your twist on the bracelet – including inspirational words is a trend now, and pairing with old-style Egyptian is brilliant, Nike. great theme- looking forward to seeing the rest of your line ! Thanks so much LOUISE!!! I love your style and that you are using history too! I love looking back and moving forward with it! Best wishes! Great theme. Gorgeous earrings. I love the dangles and the coloring. Waiting patiently on the Necklaces lol. Nice post. Nike–Great inspiration for a great theme. Including words in your design is a great idea! Maybe you could use some Egyptian hieroglyphics an/or charms in them. That would be pretty cool and pull things together even more. Thanks Lynda, I still have lots of ideas floating around and collecting ideas and objects for the final reveal~ Thanks for commenting!